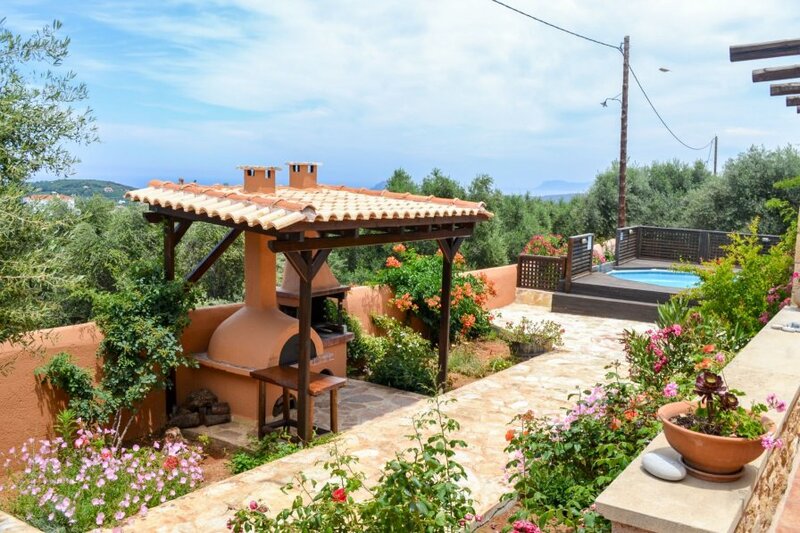 This 3-bedroom villa for up to 6 guests is located in Maleme and has a private swimming pool. Beautiful, comfortable villa Villa Xirokampi II, 2 storeys, detached, built in 2008, surrounded by fields. In the district of Maleme, 5.8 km from the beach. Private: large, well-kept garden with flowers and trees, swimming pool angular (30 m2, depth 130 cm, 01.01.-31.12.). Barbecue. Linen change 2 times per week. Towel change 2 times per week. Room cleaning 2 times per week. Parking at the house. Grocery 8.9 km, supermarket 8.9 km, restaurant 8.9 km, bakery 8.9 km, cafe 8.9 km, sandy beach Maleme 5.8 km. Minigolf 10 km, riding stable 11 km. Nearby attractions: Venizelos Graves 26 km, Chania Old Venetian Port 22 km, Chania Old Market 21 km, World War II Cemetery 7.5 km, Historic War Shelter of Platanias 10 km, Aqua Park Limnoupolis 21 km. Please note: car recommended. Suitable for families, baby equipment on request (included). Groups of teenagers on request only.